Share "Sportdog Brand: Keeping The Fun In Retriever Training"
Wouldn’t it be nice in the middle of a rough day if someone stopped by and said a few words that made all your cares go away? Instantly your negative feelings would disappear and you’d be happy. Well, in retriever training, there is something that can have that effect on your dog. We call them “fun bumpers,” and although the concept is simple, they serve an important purpose. The only rule with fun bumpers is that the dog must chase the bumper. I throw fun bumpers in some fashion everyday for each dog I’m training. With a young dog, this is how I begin each session. I continue until I see a positive attitude in the pup. After all, it serves no purpose to throw an object for your dog to retrieve if he’s not motivated. In a dog with poor retrieving desire, this fun game can build his excitement. You can nurture motivation by teasing your dog with a bumper. As his interest in the object intensifies, toss it a few feet in front of him. If he doesn’t chase, repeat the process. I’ve seen this go on for weeks in an unmotivated student. Patience is the only way to solve the problem. I’ve yet to see a dog enjoy retrieving that had the process forced upon him. Most dogs from good breeding don’t need much motivation to retrieve, but that doesn’t mean fun bumpers aren’t a useful tool at every stage of the training process. As anyone who has done much retriever training knows, there are a lot of rules you demand your dog follows – steadiness, stopping on the whistle and taking hand signals, to name a few. Therefore it is important to add a verbal command to differentiate the fun bumper routine. I use the words, “Hup, hup, hup,” prior to tossing the bumper as a verbal cue to pup that he’s about to have fun. You can use any words you prefer, but be consistent. Soon those words alone will send your dog into a frenzy of excitement. Continual repetition of the fun bumper programs gives you an extra tool for training. Fun bumpers can be used to coax a dog into water the first time. They can adjust pup’s attitude if he seems confused or lacks confidence in a new situation. And they’re enjoyable for you, too. I don’t know anyone who doesn’t smile when their retrieves with a wagging tail and happy attitude. As the dog progresses, I used fun bumpers as a reward at the end of the training session. I always follow a job well done with a couple of fun bumper tosses before the dog goes back on the truck or into his kennel. This increases his desire to work in the next training session. 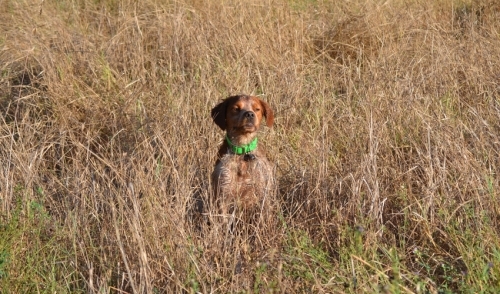 Always check your local and state regulations related to dog training and the use of game birds on private and public property.